From Wednesday, August 23, cyclists in Lincoln will be able to whizz across the city on brand new electric bikes. The bicycles are an extension to the Hirebike Lincoln scheme. New ‘e-bikes’ will be available from four docking stations; The Lawn, St Marks Shopping Centre, Burton Waters and Skellingthorpe Community Centre. Lincoln is one of the first cities in the UK to launch electric bikes as part of its bike sharing network. E-bikes are similar to pedal bikes but are power-assisted by an electric motor that can travel up to 30 miles on a single charge, requiring less effort than normal cycling. The hirebike e-bikes come complete with locks and lights, indicators on the handlebars and a ‘boost’ button for extra power, plus a handy phone App helps make it even easier to rent a bike or locate the nearest station. The scheme is celebrating its fourth birthday this year and is supported by Lincolnshire County Council’s Access Lincoln programme, which promotes sustainable and active travel in and around the city. Councillor Richard Davies, Executive Member for Highways and Transport at Lincolnshire County Council, officially launched the new e-bikes at an event held at The Lawn on Aug 23. He explained: “The introduction of the e-bikes is a valuable addition to the city, not only for Lincoln’s residents, but also for commuters, businesses and visitors who choose to travel by bike. “The bikes are fantastic, the hire bike scheme we’ve had over the last few years has been really successful and this builds on that and hopefully expands the concept of bike share to a whole new broader range of people. “I’ve had a go myself and they ride really well and with stations dotted around the city it should encourage people to get out of their car and ride round a bit. 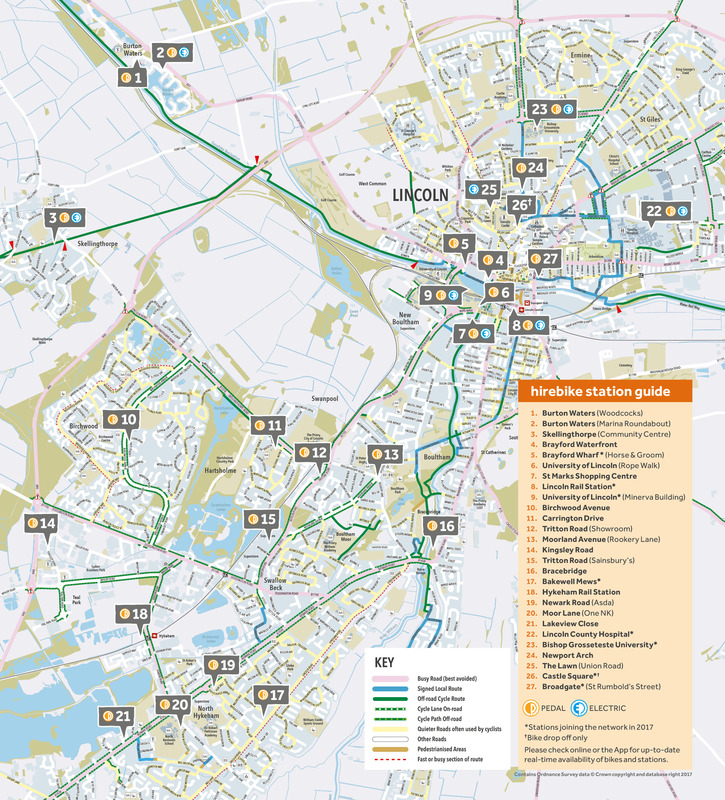 Later this year, all 20 e-bikes will be available when four more docking stations at Lincoln County Hospital, Lincoln Railway Station, Bishop Grosseteste University and the Minerva Building at University of Lincoln join the network. This will increase the hirebike network to 27 stations across Lincoln with a choice of pedal and electric bikes to rent on-demand. To celebrate the extension of the Lincoln hirebike network, new members who sign up for either an electric or pedal membership before September 1, will also receive £10 of free rental credit when they use promotional code ‘HIREBIKE£10’. Members of the public can sign up by downloading the free ‘hirebike Lincoln’ App or online here, where more information can be found, including how riders can use the electric bikes, memberships and rental options.